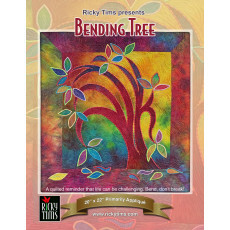 The kit contains one-of-a-kind hand-dyed fabrics (dyed in the Ricky Tims studios) and are very similar to what is shown on the original quilt. Enough fabric is provided for the quilt top and facing - nearly 2 yards total. The kit also contains the pattern, a $24.95 value. Backing and batting not included.